Who can resist the cuteness of a well-dressed child? A discounted Crazy 8 gift card will get you all the clothing and accessories you desire for your little one, for less money! What’s more, with departments in girl, boy, toddler girl, toddler boy, sale, and accessories, you can find everything you need for their entire wardrobe! The same comfortable and adorable style in sizes newborn to 14- for less money! What a great deal! With over 300 locations across the United States, you are sure to have one conveniently located close to you! You can also shop online and receive 50% off on select items and free shipping on all orders of $75.00 and more. Now just add the discount of purchasing your discounted Crazy 8 gift card, and we’re talking about some real savings! Finally, you can dress your family in the stylish clothes you love, without breaking the budget. Not only will you save money when you buy your Crazy 8 gift card at a discounted price, but gift cards are a form of currency so you can still use coupons! Be sure to check out their sales section for even more great money savings! And don’t forget- gift cards make fabulous presents as well! Why not treat that special someone in your life to one today! You can give them the gift of shopping, for less money out of your pocket! Why pay more for adorable children’s clothing when you can purchase a Crazy 8 gift card from Cards2Cash? Want to save money in other great stores? We carry discounted gift cards for many other retailers! Check out our Listings for Baby Gap, The Children’s Place, Gymboree, American Girl and more! With Cards2Cash, saving money and look great is a breeze! 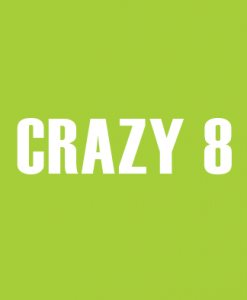 Do you have a Crazy 8 gift card that you aren’t going to use? Sell it to Cards2Cash! We pay a high percentage rate for gift cards! Visit one of our retail locations for immediate payment for your unwanted gift card OR just fill out our online form and we’ll make you an offer you’re sure to love! Cards2Cash is your one-stop gift card shop!